Waterfalls are a significant component to your tropical vacation. Here are the most popular on the Big Island. Wai’ilikahi Falls – These are amazing falls that drop 1080 feet with a huge pool at the bottom. The best way to see them is via a helicopter or plane tour of the island. If you book a helicopter tour, make sure that it covers the waterfalls up north. Most of the helicopter tours are focused on Volcanoes national park and in my opinion they miss the most beautiful part of the island. More falls to see via air would be the falls along the Hamakua coast. They are spectacular and would only be visible from above or from a boat out off the coast. 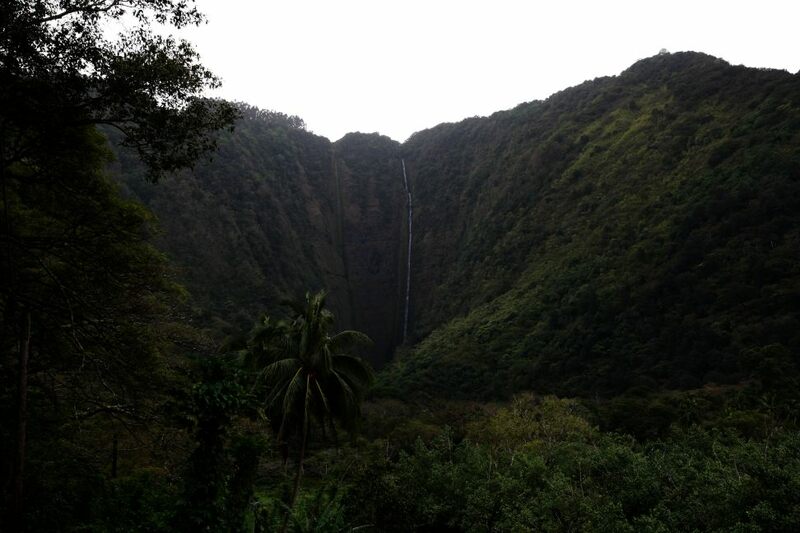 Hi’ilawe Falls – These falls travel an amazing 1300 feet or more. They are found at the end of Waipi’o valley. Akaka Falls – Water falls 420 feet at these falls. There is a short 0.4 mile loop that you hike to get to the falls. The hike is very lush and pretty. Unlike the previously mentioned falls, these are much easier to access. They are on the Hilo side of the island. To get there take Honomu road (between mile marker 13 and 14 off of highway 19). Drive to Honomu town and turn left onto Old Mamalahoa highway. There are plenty of things to see there in the next few blocks (art galleries, cafes, and gift stores) so make sure and stop on your way up to the falls or on your return trip. 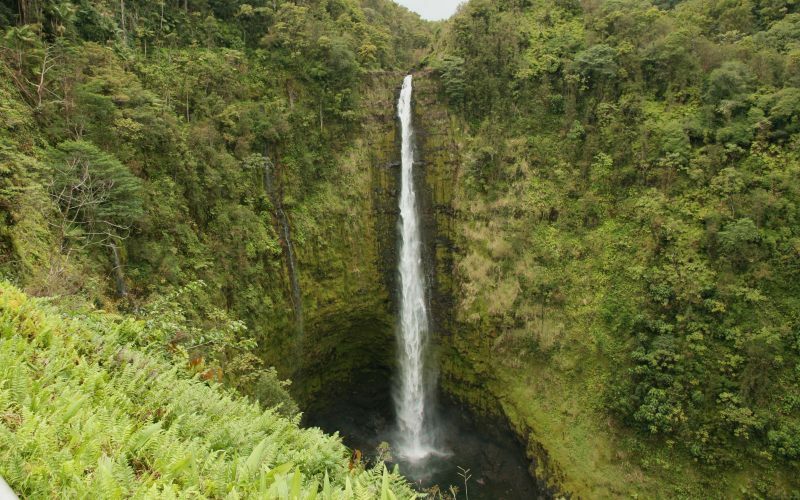 From there, take the first right onto Akaka Falls Road and drive 3.75 miles up to the falls. 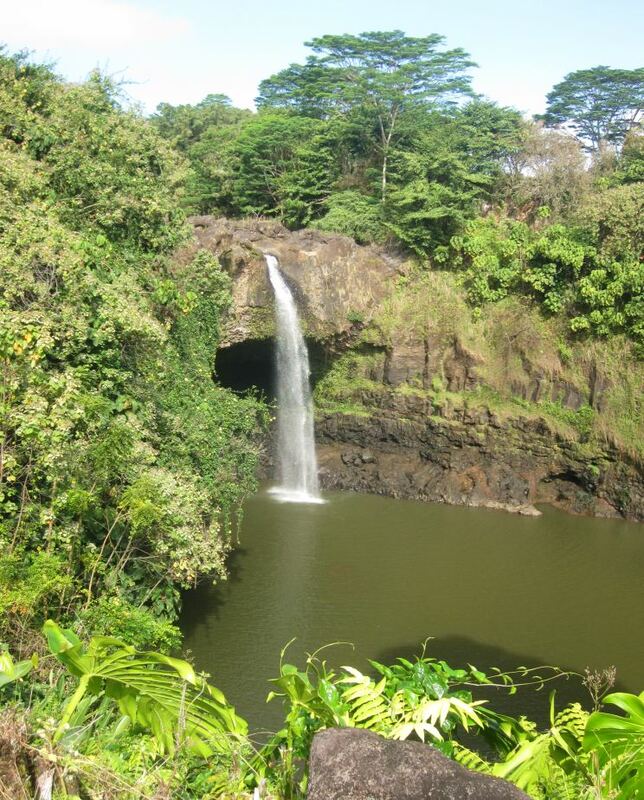 Rainbow Falls –If you spend any time in Hilo, you should definitely stop by Rainbow Falls as it is so easy to get to. Rainbow Falls can be especially pretty in the morning and may give off the rainbow for which it is named. The magnitude of the flow is dependent on the recent rainfall. 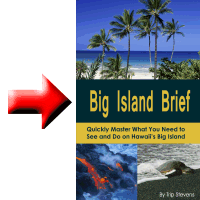 Due to Hilo’s consistent rainfall, it won’t be dried up during your visit. Water falls 80 feet. To get there from downtown Hilo, drive two miles inland on Waianuenue Avenue. Rainbow Drive will branch off to the right. Take that road and follow the signs to the falls. 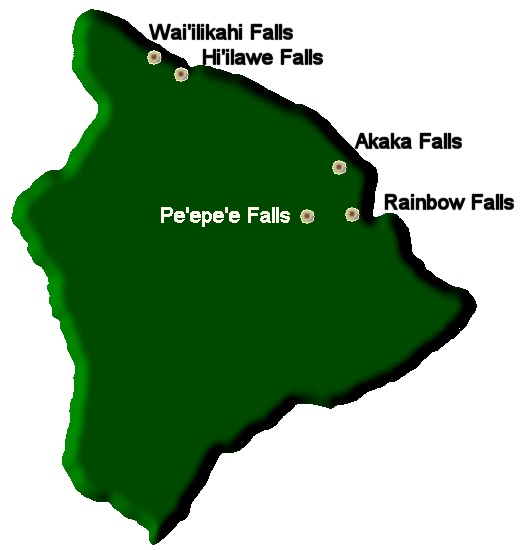 Pe’epe’e Falls – After visiting Rainbow Falls, get back onto Waianuenue Avenue and drive on 1.5 miles to Pe’epe’e Falls. These falls are slightly smaller than Rainbow Falls at 60 feet but equally as pretty.